Living in New York, I think I'm obligated to share some photographs of Olafur Eliasson's The New York City Waterfalls, which are up until mid-October. 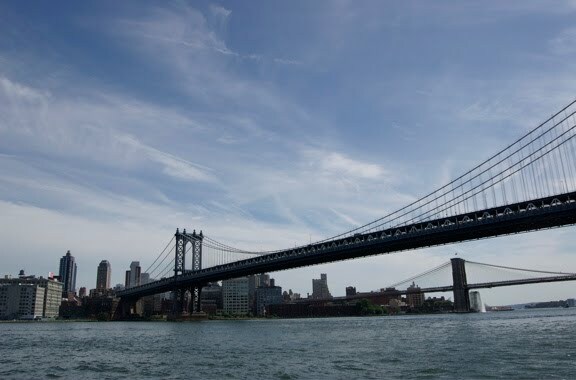 I took these along the East River, just north of the Manhattan Bridge. It was perhaps inevitable that most writers would discuss Eliasson's work in the context of that last massive work of public art in New York, Christo and Jeanne-Claude's The Gates. The general consensus seems to be that Eliasson wins that battle, and I tend to agree. Though it's odd to say about gigantic, industrial towers of plumbing, The Waterfalls are elegant, cleverly understated in their size and sound, and a charm to see on repeat viewings. In short, they are everything that The Gates were not. 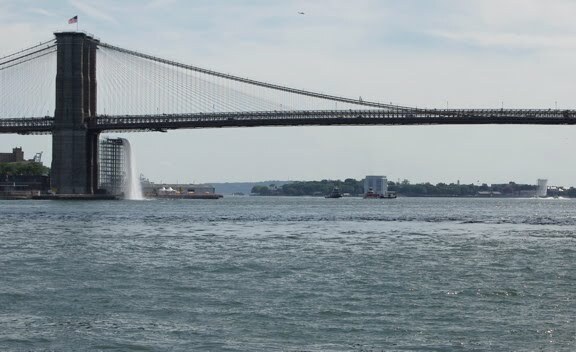 The waterfall situated under the eastern support of the Brooklyn Bridge is undoubtedly the most fun as the water appears to gush out of the century-old brick. The freestanding works, which don't signify so surreally (they're clearly man-made), on Governors Island, the Brooklyn Promenade, and Manhattan's east shore are the ones that make the project work, though. As Jerry Saltz notes, they invite you to confront the massive scale all around you. Next to the bridges and towers of New York, they're beautiful - and quaint - marking off and making you see the scale of the landscape in new ways. Distances spread and contract, depending on your viewing place. The Waterfalls function perfectly as a phenomenological experiment, but their greatest success may be as a massive invitation for New Yorkers to embrace their newly-refurbished shorelines, a subtle social engineering that exists in some of Eliasson's best work. Walking along the Henry Hudson down in the West Village last weekend, it was remarkable seeing the hundreds of people from all over Manhattan who were out enjoying the fresh parks and piers. The shores on the other side aren't nearly as developed for public space, but they're improving. Thanks to The Waterfalls, New Yorkers - who have so often reveled in their island-exceptionalism while neglecting their waterfronts - are for the first time beginning to wander over to them. 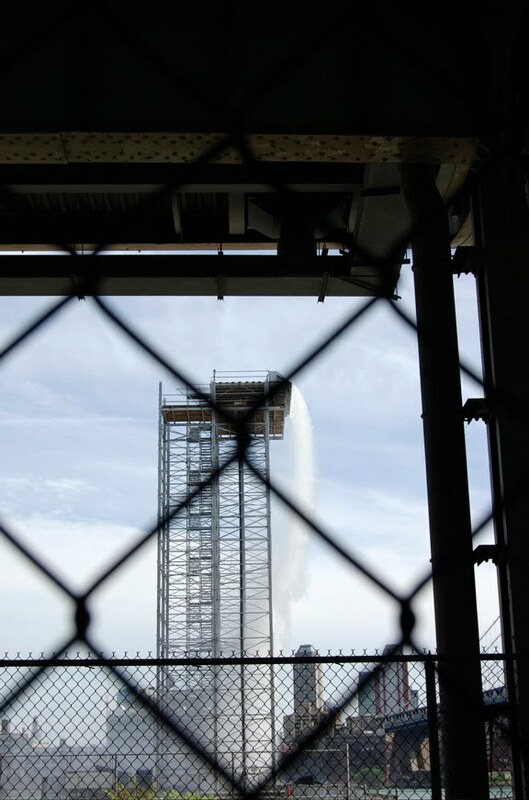 Hopefully, as some viewers peer through chain-linked fence along the Manhattan side, the project will serve as an advertisement for further investment in not only intelligent public art but thoughtful public space, as well.